The same week that this year’s “American Idol” finalists Scotty McCreery and Lauren Alaina were battling it out for the title, Guy Sebastian—one of the world’s most successful Idol winners, who took the first “Australian Idol” crown in 2003—was in Los Angeles collaborating with various songwriters and working on material for an upcoming EP that will mark his official U.S. debut. 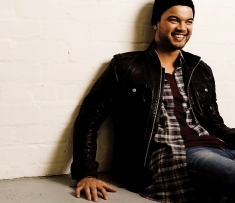 Though the multi-talented, R&B/pop singer-songwriter (www.guysebastian.com.au) is essentially starting from square one Stateside, all signs are pointing to a loving embrace by American pop fans. Two of his platinum selling Australian releases, The Memphis Album (2007) and Like It Like That (2009), are already up on iTunes and “Who’s That Girl,” his infectious song featuring lady hip-hop star Eve, is currently being promoted in various radio formats: Top 40, Hot AC and Rhythmic AC. The track is already a huge sensation in Sebastian’s homeland, where it was the second highest selling Australian artist single of 2010, selling four times platinum; it also reached #1 on the New Zealand singles chart. While many American Idol winners struggle to build and maintain large fan bases, Sebastian’s popularity back home has grown over the past eight years due to great songs, bold stylistic choices and wildly successful tours featuring legendary American musicians like the M.G.’s (Steve Cropper, Donald “Duck” Dunn and Steve Potts, who played on The Memphis Album) and Lionel Richie. His journey began with “Angels Brought Me Here,” his “winners’ song” on Idol which ARIA (Australian Recording Industry Association) named as the highest selling song of the 2000s; it also reached #1 in four Asian countries and New Zealand. Bookending that success is “Who’s that Girl,” Sebastian’s fifth single to reach #1 helping him become the first Australian male artist in history to achieve five #1 singles. While U.S. audiences gear up for the American debut of Simon Cowell’s highly-anticipated “X-Factor” talent competition this fall, Sebastian will be appearing for the second season as a judge on the Australian version. The show is unique from Idol in that the judges—which in Australia, include pop star Natalie Imbruglia—help mentor competitors in multiple categories. While Sebastian is still keeping under wraps the names of the top songwriters and producers he is working with on his U.S. debut, he is excited that one of the tracks he recently recorded was a four-on-the-floor dance floor version of Lionel Richie’s “All Night Long,” done as a duet with the artist and produced by RedOne, the two-time Grammy Award winning producer who helped shape the sound of Lady GaGa and has also worked with current “American Idol” judge Jennifer Lopez. Richie told the Daily Telegraph that he handpicked Sebastian to support him on his Spring 2011 Australian and New Zealand tour. The track, which the two recorded to raise money for Australian and New Zealand flood and earthquake relief, has already charted in those countries. While “Who’s That Girl” and the upcoming EP will be the first taste most Americans are getting of Sebastian’s music, the singer already has a rich creative history with numerous legends and contemporary music stars from the U.S. In addition to Richie and the M.G.’s, Sebastian wrote songs with Robin Thicke and Brian McKnight on his R&B oriented second album Beautiful Life, which featured a duet with American singer Mya (“Forever With You”). His most recent studio recording Like It Like That has three songs featuring John Mayer on guitar and backing vocals, as well as the platinum selling single “Art of Love,” a duet with 2007 “American Idol” winner Jordin Sparks. Sebastian adds that the reason he vibes so naturally with American artists of different generations is that while he is considered a pop star by virtue of his notoriety from “Australian Idol” and many chart successes, he considers himself a blues, gospel and R&B singer at the core. “Those are my true loves, and what I was raised on,” he says. “I loved Sam Cooke and especially his early work with The Soul Stirrers. I grew up listening to Al Green, Stevie Wonder, Donny Hathaway and other great vocalists who inspired my passion to sing. When I look at what I want to do with my career from this point, I have such an expansive love of music, I don’t want to confine it to any one thing. What’s cool about pop radio these days is that you have everything from Lady GaGa and Adele to Tao Cruz, Beyoncé and Bruno Mars. In the end, everything comes down to a great song. When I write, I ask myself, ‘how would this sound just with me and a guitar’? He complements the places in the world he has conquered musically with those he has influenced via an impressive slate of charity work and commitments to important causes. Sebastian has served as an ambassador for the Ronald McDonald House Charities and is currently an ambassador as well for the Australian Red Cross and Golden Stave, the Australian music and entertainment industry’s charity fundraising organization. In addition, Sebastian is an ambassador for World Vision Australia, and in 2005 traveled to Uganda to film a World Vision documentary “An Idol in Africa” for a network TV special. He has continued his work with the organization, supporting the Child Rescue and the 40 Hour Famine programs and is also involved in the Make Poverty History coalition. In 2008, he was presented with the Extreme Inspiration Award at the Dolly Teen Choice Awards for his continuing support of World Vision. Currently, he is strongly committed to the Sony Foundation, which raises funds to help young Australians facing homelessness, severe illness, disability and isolation. Sebastian has performed on behalf of the Royal Flying Doctor’s Service, Legacy (an organization which supports the families of deceased veterans) and the Royal Children’s Hospital.